Severe, life-threatening skin reactions, including fatal cases, have occurred in patients treated with nevirapine. These have included cases of Stevens-Johnson syndrome, toxic epidermal necrolysis, and hypersensitivity reactions characterized by rash, constitutional findings, and organ dysfunction. Patients developing signs or symptoms of severe skin reactions or hypersensitivity reactions must discontinue nevirapine and seek medical evaluation immediately. Transaminase levels should be checked immediately for all patients who develop a rash in the first 18 weeks of treatment. The 14-day lead-in period with nevirapine 200 mg daily dosing has been observed to decrease the incidence of rash and must be followed [see Warnings and Precautions (5.2)]. These highlights do not include all the information needed to use NEVIRAPINE ORAL SUSPENSION safely and effectively. See full prescribing information for NEVIRAPINE ORAL SUSPENSION. Nevirapine oral suspension is indicated in combination with other antiretroviral agents for the treatment of human immunodeficiency virus (HIV-1) infection in adults and pediatric patients 15 days and older [see Clinical Studies (14.1, 14.2)]. adult males with CD4+ cell counts greater than 400 cells/mm3[see Warnings and Precautions (5.1)]. The recommended dose for nevirapine oral suspension is 200 mg daily for the first 14 days, followed by 200 mg twice daily, in combination with other antiretroviral agents. The 14-day lead-in period with nevirapine oral suspension 200 mg daily dosing must be strictly followed as the lead-in period has been observed to decrease the incidence of rash [see Dosage and Administration (2.4) and Warnings and Precautions (5.2)]. If rash persists beyond the 14-day lead-in period, do not dose escalate to 200 mg twice daily. The 200 mg once-daily dosing regimen should not be continued beyond 28 days, at which point, an alternative regimen should be sought. For concomitantly administered antiretroviral therapy, the manufacturer’s recommended dosage and monitoring should be followed. Nevirapine suspension should be shaken gently prior to administration. It is important to administer the entire measured dose of suspension by using an oral dosing syringe or dosing cup. An oral dosing syringe is recommended, particularly for volumes of 5 mL or less. If a dosing cup is used, it should be thoroughly rinsed with water and the rinse should also be administered to the patient. Intensive clinical and laboratory monitoring, including liver enzyme tests, is essential at baseline and during the first 18 weeks of treatment with nevirapine oral suspension. The optimal frequency of monitoring during this period has not been established. Some experts recommend clinical and laboratory monitoring more often than once per month, and in particular, would include monitoring of liver enzyme tests at baseline, prior to dose escalation, and at two weeks post-dose escalation. After the initial 18-week period, frequent clinical and laboratory monitoring should continue throughout nevirapine oral suspension treatment [see Warnings and Precautions (5)]. In some cases, hepatic injury has progressed despite discontinuation of treatment. Discontinue nevirapine oral suspension if a patient experiences severe rash or any rash accompanied by constitutional findings [see Warnings and Precautions (5.2)]. Do not increase nevirapine oral suspension dose if a patient experiences mild to moderate rash without constitutional symptoms during the 14-day lead-in period of 200 mg/day (150 mg/m2/day in pediatric patients) until the rash has resolved [see Warnings and Precautions (5.2)]. The total duration of the once daily lead-in dosing period should not exceed 28 days at which point an alternative regimen should be sought. If a clinical (symptomatic) hepatic event occurs, permanently discontinue nevirapine oral suspension. Do not restart nevirapine oral suspension after recovery [see Warnings and Precautions (5.1)]. For patients who interrupt nevirapine oral suspension dosing for more than 7 days, restart the recommended dosing, 200 mg daily (150 mg/m2/day in pediatric patients) for the first 14 days (lead-in) followed by 200 mg twice daily (150 mg/m2 twice daily for pediatric patients). Patients with CrCL greater than or equal to 20 mL per min do not require an adjustment in nevirapine oral suspension dosing. The pharmacokinetics of nevirapine have not been evaluated in patients with CrCL less than 20 mL per min. An additional 200 mg dose of nevirapine oral suspension following each dialysis treatment is indicated in patients requiring dialysis. Nevirapine metabolites may accumulate in patients receiving dialysis; however, the clinical significance of this accumulation is not known [see Clinical Pharmacology (12.3)]. Nevirapine oral suspension is a white to off-white homogenous suspension containing 50 mg nevirapine (as nevirapine hemihydrate) in each 5 mL. Severe, life-threatening, and in some cases fatal hepatotoxicity, including fulminant and cholestatic hepatitis, hepatic necrosis and hepatic failure, have been reported in patients treated with nevirapine. In controlled clinical trials, symptomatic hepatic events regardless of severity occurred in 4% (range 0% to 11%) of subjects who received nevirapine and 1% of subjects in control groups. The risk of symptomatic hepatic events regardless of severity was greatest in the first 6 weeks of therapy. The risk continued to be greater in the nevirapine groups compared to controls through 18 weeks of treatment. However, hepatic events may occur at any time during treatment. In some cases, subjects presented with non­-specific, prodromal signs or symptoms of fatigue, malaise, anorexia, nausea, jaundice, liver tenderness or hepatomegaly, with or without initially abnormal serum transaminase levels. Rash was observed in approximately half of the subjects with symptomatic hepatic adverse events. Fever and flu-like symptoms accompanied some of these hepatic events. Some events, particularly those with rash and other symptoms, have progressed to hepatic failure with transaminase elevation, with or without hyperbilirubinemia, hepatic encephalopathy, prolonged partial thromboplastin time, or eosinophilia. Rhabdomyolysis has been observed in some patients experiencing skin and/or liver reactions associated with nevirapine use. Hepatitis/hepatic failure may be associated with signs of hypersensitivity which can include severe rash or rash accompanied by fever, general malaise, fatigue, muscle or joint aches, blisters, oral lesions, conjunctivitis, facial edema, eosinophilia, granulocytopenia, lymphadenopathy, or renal dysfunction. Patients with signs or symptoms of hepatitis must be advised to discontinue nevirapine and immediately seek medical evaluation, which should include liver enzyme tests. The patients at greatest risk of hepatic events, including potentially fatal events, are women with high CD4+ cell counts. In general, during the first 6 weeks of treatment, women have a 3-fold higher risk than men for symptomatic, often rash-associated, hepatic events (6% versus 2%), and patients with higher CD4+ cell counts at initiation of nevirapine therapy are at higher risk for symptomatic hepatic events with nevirapine. In a retrospective review, women with CD4+ cell counts greater than 250 cells/mm3 had a 12-fold higher risk of symptomatic hepatic adverse events compared to women with CD4+ cell counts less than 250 cells/mm3 (11% versus 1%). An increased risk was observed in men with CD4+ cell counts greater than 400 cells/mm3 (6% versus 1% for men with CD4+ cell counts less than 400 cells/mm3). However, all patients, regardless of gender, CD4+ cell count, or antiretroviral treatment history, should be monitored for hepatotoxicity since symptomatic hepatic adverse events have been reported at all CD4+cell counts. Co-infection with hepatitis B or C and/or increased transaminase elevations at the start of therapy with nevirapine are associated with a greater risk of later symptomatic events (6 weeks or more after starting nevirapine) and asymptomatic increases in AST or ALT. Therapy with nevirapine must be initiated with a 14-day lead-in period of 200 mg per day (150 mg/m2 per day in pediatric patients), which has been shown to reduce the frequency of rash. Discontinue nevirapine if a patient experiences severe rash or any rash accompanied by constitutional findings. Do not increase nevirapine dose to a patient experiencing a mild to moderate rash without constitutional symptoms during the 14-day lead-in period of 200 mg per day (150 mg/m2/day in pediatric patients) until the rash has resolved. The total duration of the once-daily lead-in dosing period must not exceed 28 days at which point an alternative regimen should be sought [see Dosage and Administration (2.4)]. Patients must be monitored closely if isolated rash of any severity occurs. Delay in stopping nevirapine treatment after the onset of rash may result in a more serious reaction. Concomitant use of St. John's wort (Hypericum perforatum) or St. John's wort-containing products and nevirapine is not recommended. Co-administration of St. John’s wort with non-nucleoside reverse transcriptase inhibitors (NNRTIs), including nevirapine, is expected to substantially decrease NNRTI concentrations and may result in sub-optimal levels of nevirapine and lead to loss of virologic response and possible resistance to nevirapine or to the class of NNRTIs. Co-administration of nevirapine and efavirenz is not recommended as this combination has been associated with an increase in adverse reactions and no improvement in efficacy. Clarithromycin exposure was significantly decreased by nevirapine; however, 14-OH metabolite concentrations were increased. Because clarithromycin active metabolite has reduced activity against Mycobacterium avium- intracellulare complex, overall activity against this pathogen may be altered. Alternatives to clarithromycin, such as azithromycin, should be considered. Available data from the APR show no difference in the risk of overall major birth defects for nevirapine compared with the background rate for major birth defects of 2.7% in the U.S. reference population of the Metropolitan Atlanta Congenital Defects Program (MACDP) [see Data]. The rate of miscarriage is not reported in the APR. The estimated background rate of miscarriage in clinically recognized pregnancies in the U.S. general population is 15 to 20%. The background risk of birth defects and miscarriage for the indicated population is unknown. Methodological limitations of the APR include the use of MACDP as the external comparator group. The MACDP population is not disease-specific, evaluates women and infants from a limited geographic area, and does not include outcomes for births that occurred at <20 weeks gestation. Based on prospective reports to the APR of over 2600 exposures to nevirapine during pregnancy resulting in live births (including over 1100 exposed in the first trimester), there was no difference between nevirapine and overall birth defects compared with the background birth defect rate of 2.7% in the U.S. reference population of the MACDP. The prevalence of birth defects in live births was 2.8% (95% CI: 1.9%, 4%) following first trimester exposure to nevirapine-containing regimens and 3.2% (95% CI: 2.4%, 4.3%) for second/third trimester exposure to nevirapine-containing regimens. Based on five publications, immediate-release nevirapine was excreted in breast-milk at median concentrations ranging from 4080 to 6795 ng/mL, and the median maternal breast-milk to maternal plasma concentration ratio range was 59 to 88%. Reported infant nevirapine median plasma concentrations were low, ranging from 734 to 1140 ng/mL. The estimated nevirapine dose of 704 to 682 mcg/kg/day for infants fed exclusively with breast-milk was lower than the daily recommended nevirapine dose for infants. Published literature indicates that rash and hyperbilirubinemia have been seen in infants exposed to nevirapine through breastmilk. The safety, pharmacokinetic profile, and virologic and immunologic responses of nevirapine have been evaluated in HIV-1 infected pediatric subjects age 3 months to 18 years [see Adverse Reactions (6.1) and Clinical Studies (14.2)]. The safety and pharmacokinetic profile of nevirapine has been evaluated in HIV-1 infected pediatric subjects age 15 days to less than 3 months [see Adverse Reactions (6.1) and Clinical Studies (14.2)]. There is no known antidote for nevirapine overdosage. Cases of nevirapine overdose at doses ranging from 800 to 1800 mg per day for up to 15 days have been reported. Patients have experienced events including edema, erythema nodosum, fatigue, fever, headache, insomnia, nausea, pulmonary infiltrates, rash, vertigo, vomiting, and weight decrease. All events subsided following discontinuation of nevirapine. Nevirapine is a non-nucleoside reverse transcriptase inhibitor (NNRTI) with activity against Human Immunodeficiency Virus Type 1 (HIV-1). Nevirapine is structurally a member of the dipyridodiazepinone chemical class of compounds. Nevirapine oral suspension, USP is for oral administration. Each 5 mL of nevirapine oral suspension contains 50 mg of nevirapine (as nevirapine hemihydrate). The suspension also contains the following excipients: carbopol 974PNF, methylparaben, propylparaben, non crystallizing sorbitol solution, sucrose, propylene glycol, polysorbate 80, sodium hydroxide, and purified water. Nevirapine is readily absorbed (greater than 90%) after oral administration in healthy volunteers and in adults with HIV-1 infection. Absolute bioavailability in 12 healthy adults following single-dose administration was 93 ± 9% (mean ± SD) for a 50 mg tablet and 91 ± 8% for an oral solution. Peak plasma nevirapine concentrations of 2 ± 0.4 mcg/mL (7.5 micromolar) were attained by 4 hours following a single 200 mg dose. Following multiple doses, nevirapine peak concentrations appear to increase linearly in the dose range of 200 to 400 mg/day. Steady-state trough nevirapine concentrations of 4.5 ± 1.9 mcg/mL (17 ± 7 micromolar), (n=242) were attained at 400 mg per day. Nevirapine tablets and suspension have been shown to be comparably bioavailable and interchangeable at doses up to 200 mg. When nevirapine (200 mg) was administered to 24 healthy adults (12 female, 12 male), with either a high-fat breakfast (857 kcal, 50 g fat, 53% of calories from fat) or antacid (Maalox® 30 mL), the extent of nevirapine absorption (AUC) was comparable to that observed under fasting conditions. In a separate trial in HIV-1 infected subjects (n=6), nevirapine steady-state systemic exposure (AUC τ) was not significantly altered by didanosine, which is formulated with an alkaline buffering agent. Nevirapine may be administered with or without food, antacid or didanosine. Nevirapine is highly lipophilic and is essentially nonionized at physiologic pH. Following intravenous administration to healthy adults, the apparent volume of distribution (Vdss) of nevirapine was 1.21 ± 0.09 L/kg, suggesting that nevirapine is widely distributed in humans. Nevirapine readily crosses the placenta and is also found in breast milk [see Use in Specific Populations (8.2)]. Nevirapine is about 60% bound to plasma proteins in the plasma concentration range of 1 to 10 mcg per mL. Nevirapine concentrations in human cerebrospinal fluid (n=6) were 45% (±5%) of the concentrations in plasma; this ratio is approximately equal to the fraction not bound to plasma protein. Nevirapine is an inducer of hepatic cytochrome P450 (CYP) metabolic enzymes 3A and 2B6. Nevirapine induces CYP3A and CYP2B6 by approximately 20 to 25%, as indicated by erythromycin breath test results and urine metabolites. Autoinduction of CYP3A and CYP2B6 mediated metabolism leads to an approximately 1.5- to 2-fold increase in the apparent oral clearance of nevirapine as treatment continues from a single dose to two-to-four weeks of dosing with 200 to 400 mg per day. Autoinduction also results in a corresponding decrease in the terminal phase half-life of nevirapine in plasma, from approximately 45 hours (single dose) to approximately 25 to 30 hours following multiple dosing with 200 to 400 mg per day. HIV-1 seronegative adults with mild (CrCL 50 to 79 mL per min; n=7), moderate (CrCL 30 to 49 mL per min; n=6), or severe (CrCL less than 30 mL per min; n=4) renal impairment received a single 200 mg dose of nevirapine in a pharmacokinetic trial. These subjects did not require dialysis. The trial included six additional subjects with renal failure requiring dialysis. In a steady-state trial comparing 46 subjects with mild (n=17; expansion of some portal areas; Ishak Score 1 to 2), moderate (n=20; expansion of most portal areas with occasional portal-to-portal and portal-to-central bridging; Ishak Score 3 to 4), or severe (n=9; marked bridging with occasional cirrhosis without decompensation indicating Child-Pugh A; Ishak Score 5 to 6) fibrosis as a measure of hepatic impairment, the multiple dose pharmacokinetic disposition of nevirapine and its five oxidative metabolites were not altered. However, approximately 15% of these subjects with hepatic fibrosis had nevirapine trough concentrations above 9,000 mcg per mL (2-fold the usual mean trough). Therefore, patients with hepatic impairment should be monitored carefully for evidence of drug-induced toxicity [see Warnings and Precautions (5.1)]. The subjects studied were receiving antiretroviral therapy containing nevirapine 200 mg twice daily for at least 6 weeks prior to pharmacokinetic sampling, with a median duration of therapy of 3.4 years. Black subjects (n=80/group) in Trial 1100.1486 showed approximately 30% to 35% higher trough concentrations than Caucasian subjects (250 to 325 subjects/group) in both immediate-release nevirapine and nevirapine extended-release treatment groups over 96 weeks of treatment at 400 mg per day. Nevirapine pharmacokinetics in HIV-1-infected adults do not appear to change with age (range 18 to 68 years); however, nevirapine has not been extensively evaluated in subjects beyond the age of 55 years [see Use in Specific Populations (8.5)]. BI Trial 1100.1368 studied the safety, efficacy, and pharmacokinetics of a weight-based and a body surface area (BSA)-based dosing regimen of nevirapine. In the weight-based regimen, pediatric subjects up to 8 years of age received a dose of 4 mg/kg once daily for two weeks followed by 7 mg per kg twice daily thereafter. Subjects 8 years and older were dosed 4 mg/kg once daily for two weeks followed by 4 mg/kg twice daily thereafter. In the BSA regimen, all pediatric subjects received 150 mg/m2 once daily for two weeks followed by 150 mg/m2 twice daily thereafter [see Use in Specific Populations (8.4) and Adverse Reactions (6.1)]. Dosing of nevirapine at 150 mg/m2 BID (after a two-week lead-in of 150 mg/m2 QD) produced geometric mean or mean trough nevirapine concentrations between 4 to 6 mcg per mL (as targeted from adult data). In addition, the observed trough nevirapine concentrations were comparable between the two dosing regimens studied (BSA- and weight-based methods). The antiviral activity of nevirapine has been measured in a variety of cell lines including peripheral blood mononuclear cells, monocyte-derived macrophages, and lymphoblastoid cell lines. In an assay using human embryonic kidney 293 cells, the median EC50 value (50% inhibitory concentration) of nevirapine was 90 nM against a panel of 2923 wild-type isolates of HIV-1 that were primarily (93%) clade B clinical isolates from the United States. The 99th percentile EC50 value was 470 nM in this trial. The median EC50 value was 63 nM (range 14 to 302 nM, n=29) against clinical isolates of HIV-1 clades A, B, C, D, F, G, and H, and circulating recombinant forms CRF01_AE, CRF02_AG and CRF12_BF. Nevirapine had no antiviral activity in cell culture against group O HIV-1 isolates (n=3) or HIV-2 isolates (n=3) replicating in cord blood mononuclear cells. 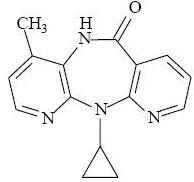 Nevirapine in combination with efavirenz exhibited strong antagonistic anti-HIV-1 activity in cell culture and was additive to antagonistic with the protease inhibitor ritonavir or the fusion inhibitor enfuvirtide. The anti-HIV-1 activity of nevirapine was not antagonistic in combination with the NRTIs abacavir, didanosine, emtricitabine, lamivudine, stavudine, tenofovir and zidovudine, and the protease inhibitors amprenavir, atazanavir, indinavir, lopinavir, nelfinavir, saquinavir and tipranavir. The anti-HIV-1 activity of nevirapine was antagonized by the anti-HBV drug adefovir and by the anti-HCV drug ribavirin in cell culture. Phenotypic and genotypic changes in HIV-1 isolates from treatment-naïve subjects receiving either nevirapine (n=24) or nevirapine and zidovudine (n=14) were monitored in Phase 1 and 2 trials ranging from 1 to 12 weeks or longer. After 1 week of nevirapine monotherapy, isolates from 3/3 subjects had decreased susceptibility to nevirapine in cell culture. One or more of the RT mutations resulting in amino acid substitutions K103N, V106A, V108I, Y181C, Y188C, and G190A were detected in HIV-1 isolates from some subjects as early as 2 weeks after therapy initiation. By week eight of nevirapine monotherapy, 100% of the subjects tested (n=24) had HIV-1 isolates with a greater than 100-fold decrease in susceptibility to nevirapine in cell culture compared to baseline, and had one or more of the nevirapine­-associated RT resistance substitutions. Nineteen of these subjects (80%) had isolates with Y181C substitutions regardless of dose. For trial 1100.1486, genotypic analysis was performed for baseline and on-therapy isolates from 23 and 34 subjects who experienced virologic failure in the nevirapine extended-release tablets and immediate-release nevirapine treatment group, respectively. Nevirapine resistance-associated substitutions developed in the on-therapy isolates of 78% (18/23) of the subjects who had virologic failures in the nevirapine extended-release tablets treatment group and 88% (30/34) of the subjects in the immediate-release nevirapine treatment group, respectively. The Y181C nevirapine resistance-associated substitution was found alone or in combination with other nevirapine resistance-associated substitutions (K101E, K103N, V106A, V108I, V179D/E/I, Y188 C/F/H/L/N, G190A, P225H, F227L, M230L) in isolates from 14 subjects failing nevirapine extended-release tablets treatment and 25 subjects failing immediate-release nevirapine treatment. On-therapy isolates from 1 subject in nevirapine extended-release tablets treatment group developed a novel amino acid substitution Y181I and isolates from another subject in the immediate-release nevirapine treatment group developed a novel amino acid substitution Y188N. Phenotypic analysis showed that Y188N and Y181I substitutions conferred 103- and 22-fold reductions in susceptibility to nevirapine, respectively. Trial BI 1046 (INCAS) was a double-blind, placebo-controlled, randomized, three-arm trial with 151 HIV-1 infected subjects with CD4+ cell counts of 200 to 600 cells/mm3 at baseline. BI 1046 compared treatment with nevirapine+zidovudine+didanosine to nevirapine+zidovudine and zidovudine+didanosine. Treatment doses were nevirapine at 200 mg daily for two weeks followed by 200 mg twice daily or placebo, zidovudine at 200 mg three times daily, and didanosine at 125 or 200 mg twice daily (depending on body weight). The subjects had mean baseline HIV-1 RNA of 4.41 log10 copies/mL (25,704 copies per mL) and mean baseline CD4+ cell count of 376 cells/mm3. The primary endpoint was the proportion of subjects with HIV-1 RNA less than 400 copies per mL and not previously failed at 48 weeks. The virologic responder rates at 48 weeks were 45% for subjects treated with nevirapine+zidovudine+didanosine, 19% for subjects treated with zidovudine+didanosine, and 0% for subjects treated with nevirapine+zidovudine. CD4+ cell counts in the nevirapine+ZDV+ddI group increased above baseline by a mean of 139 cells/mm3 at one year, significantly greater than the increase of 87 cells/mm3 in the ZDV+ddI subjects. The nevirapine+ZDV group mean decreased by 6 cells/mm3 below baseline. Baseline demographics included: 49% male; 81% Black and 19% Caucasian; 4% had previous exposure to ARVs. Subjects had a median baseline HIV-1 RNA of 5.45 log10 copies per mL and a median baseline CD4+ cell count of 527 cells/mm3 (range 37 to 2279). One hundred and five (85%) completed the 48-week period while 18 (15%) discontinued prematurely. Of the subjects who discontinued prematurely, 9 (7%) discontinued due to adverse reactions and 3 (2%) discontinued due to virologic failure. Overall the proportion of subjects who achieved and maintained an HIV-1 RNA less than 400 copies per mL at 48 weeks was 47% (58/123). Nevirapine Oral Suspension, USP is a white to off-white homogenous suspension containing 50 mg nevirapine (as nevirapine hemihydrate) in each 5 mL. Nevirapine suspension is supplied in HDPE bottles with child-resistant closures. 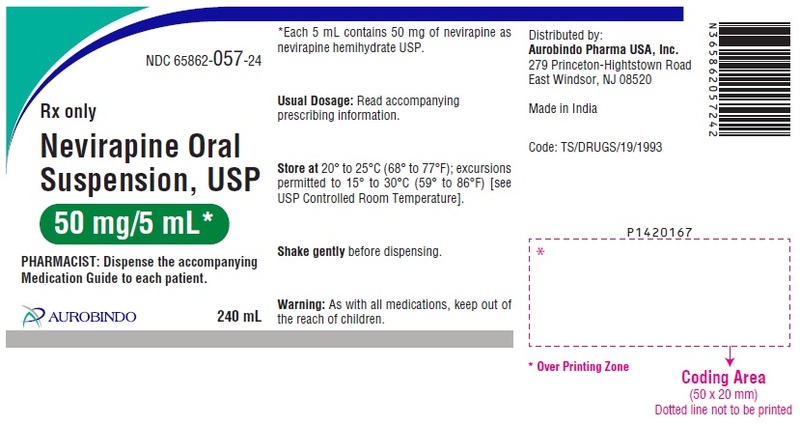 Nevirapine Oral Suspension, USP should be stored at 20° to 25°C (68° to 77°F); excursions permitted to 15° to 30°C (59° to 86°F) [see USP Controlled Room Temperature]. Store in a safe place out of the reach of children. To avoid overdose, inform patients that they should never take immediate-release nevirapine and extended-release nevirapine tablets concomitantly. Advise females of reproductive potential of the potential for impaired fertility from nevirapine [see Use in Specific Populations (8.3) and Nonclinical Toxicology (13.1)]. What is the most important information I should know about nevirapine oral suspension? Nevirapine oral suspension can cause severe liver and skin problems that may lead to death. These problems can happen at any time during treatment, but your risk is higher during the first 18 weeks of treatment. • Severe liver problems. Some people taking nevirapine oral suspension may develop severe liver problems that can lead to liver failure and the need for a liver transplant, or death. If you have liver problems you may get a rash. • Women have a higher risk of developing liver problems during treatment with nevirapine oral suspension than men. • Women with CD4+ counts higher than 250 cells/mm3. This group has the highest risk. • Men with CD4+ counts higher than 400 cells/mm3. • Severe skin reactions and rash. Some skin reactions and rashes may be severe, life-threatening, and in some people, may lead to death. Most severe skin reactions and rashes happen in the first 6 weeks of treatment with nevirapine oral suspension. • Women have a higher risk of developing a rash during treatment with nevirapine oral suspension than men. Your doctor should do blood tests often to check your liver function and check for severe skin reactions during the first 18 weeks of treatment with nevirapine oral suspension. You should continue to see your doctor and have your liver checked regularly during your treatment with nevirapine oral suspension. It is important for you to keep all of your doctor appointments. If your doctor tells you to stop treatment with nevirapine oral suspension because you have had any of the severe liver or skin symptoms listed above, you should never take nevirapine oral suspension again. See “What are the possible side effects of nevirapine oral suspension?” for more information about side effects. What is nevirapine oral suspension? Nevirapine oral suspension is prescription HIV-1 medicines used with other HIV-1 medicines to treat HIV-1 (Human Immunodeficiency Virus 1) in adults and in children 15 days of age or older. HIV-1 is the virus that causes AIDS (Acquired Immune Deficiency Syndrome). If you are a woman with CD4+ counts higher than 250 cells/mm3 or a man with CD4+ counts higher than 400 cells/mm3, you and your doctor will decide if starting nevirapine oral suspension is right for you. as part of occupational and non-occupational post-exposure prophylaxis (PEP) regimens. nevirapine oral suspension is only for people diagnosed with HIV-1. If you have not been diagnosed as HIV positive, then do not take nevirapine oral suspension. are pregnant or plan to become pregnant. It is not known if nevirapine oral suspension will harm your unborn baby. Pregnancy Registry: There is a pregnancy registry for women who take nevirapine oral suspension during pregnancy. The purpose of the registry is to collect information about the health of you and your baby. Talk to your doctor about how you can take part in this registry. are breastfeeding or plan to breastfeed. Nevirapine can pass into your breast milk and may harm your baby. You should not breastfeed if you have HIV-1 because of the risk of passing HIV-1 to your baby. Do not breastfeed during treatment with nevirapine oral suspension. Talk to your doctor about the best way to feed your baby. Some medicines interact with nevirapine oral suspension. Keep a list of your medicines to show your doctor or pharmacist. You can ask your doctor or pharmacist for a list of medicines that interact with nevirapine oral suspension. Do not start taking a new medicine without telling your doctor. Your doctor can tell you if it is safe to take nevirapine oral suspension with other medicines. How should I take nevirapine oral suspension? Take nevirapine oral suspension exactly as your doctor tells you to take it. Do not change your dose unless your doctor tells you to. Nevirapine oral suspension is always taken in combination with other antiretroviral medicines. You should not take more than one form of nevirapine at the same time. Talk to your doctor if you have any questions. If your child is prescribed nevirapine oral suspension, your child’s doctor will tell you exactly how nevirapine oral suspension should be taken. Nevirapine oral suspension can be taken with or without food. Do not miss a dose of nevirapine oral suspension. If you miss a dose of nevirapine oral suspension, take the missed dose as soon as you remember. If it is almost time for your next dose, do not take the missed dose. You should take the next dose at your regular time. Do not take 2 doses at the same time. If you stop taking nevirapine oral suspension for more than 7 days, ask your doctor how much to take before you start taking it again. You may need to begin taking the nevirapine oral suspension starting dose again, which is taken 1 time each day for 14 days. Your doctor should start you with 1 dose each day to lower your chance of getting a serious rash. It is important that you only take 1 dose of nevirapine oral suspension each day for the first 14 days. Call your doctor right away if you get a skin rash during the first 14 days of nevirapine oral suspension treatment. You should never take your starting dose for longer than 28 days. If after 28 days you are still receiving this starting dose because you have a rash, you and your doctor should talk about prescribing another HIV-1 medicine for you instead of nevirapine oral suspension. Take nevirapine extended-release tablets 1 time a day as prescribed by your doctor. You may sometimes pass a soft mass in your stools (bowel movement) that looks like your nevirapine extended-release tablets. This will not affect the way your medicine works. If you or your child takes nevirapine oral suspension (liquid), shake it gently before each use. Use an oral dosing syringe or dosing cup to measure the right dose. The oral dosing syringe and dosing cup are not provided with nevirapine oral suspension. Ask your pharmacist for a syringe or cup if you do not have one. What are the possible side effects of nevirapine oral suspension? The most common side effect of nevirapine oral suspension is rash. Nevirapine oral suspension may cause decreased fertility in females. Talk to your doctor if you have concerns about fertility. These are not all the possible side effects of nevirapine oral suspension. For more information, ask your doctor or pharmacist. How should I store nevirapine oral suspension? Nevirapine oral suspension should be stored at 20° to 25°C (68° to 77°F) excursions permitted to 15° to 30°C (59° to 86°F). Keep nevirapine oral suspension and all medicines out of the reach of children. General information about the safe and effective use of nevirapine oral suspension. Medicines are sometimes prescribed for purposes other than those listed in a Medication Guide. Do not use nevirapine oral suspension for a condition for which it was not prescribed. Do not give nevirapine oral suspension to other people, even if they have the same condition you have. It may harm them. You can ask your pharmacist or doctor for information about nevirapine oral suspension that is written for health professionals. What are the ingredients in nevirapine oral suspension? Inactive ingredients: carbopol 974PNF, methylparaben, propylparaben, non crystallizing sorbitol solution, sucrose, propylene glycol, polysorbate 80, sodium hydroxide, and purified water.